Rubik's World's opening credits are short and skippable. Getting around in the game is simple, intuitive, and entirely touch-based. "Multiplayer" is right on the main menu and "Host" follows immediately after. Download time is under one minute. The menu options are well-spaced, clearly outlined, and well-labeled. The basic game mechanics fit into two categories. Fit and Switch involve basic tapping. Tap a Cubie (Switch) or tap a Cubie and then tap its destination (Fit). In both cases, the outlined areas that can be tapped read accurately, respond appropriately, and react in a timely fashion, which is essential to the gameplay. The Rubik's Cube mini game, on the other hand, involves a line-drawing mechanic where lines are drawn along the cube to rotate a line. The cube is not in a set position, and so the lines' directions are based on the cube's facing. Very careful lines rotate what you want when you want, but the sensitivity seems amped up so that it's easy to rotate something unintentionally from a light touch. The same issue comes up when spinning the entire cube for a different angle: accidentally tap the cube and something spun unintentionally. It's not big problem if you're careful, but it is annoying. Rubik's World's multiplayer features three different activities that feel like three different activities (as opposed to three different versions of the same thing). There aren't any options (with the exception of the size of the Cube in the Rubik's Cube minigame) to choose from. Graphically, the basic look is fairly simple (which is all it needs), but some of the animations are done in a comparatively advanced amount of detail. The guest has no sound, but (in theory) both players are close enough to hear the host's audio. Going into my reviewing of Rubik's World, I didn't expect too much. I hadn't heard much about it, and I usually hear at least something about the better games. What I found when I started playing least me very pleasantly surprised. Rubik's World is a charming little puzzle game that features innovative concepts. It's fun. In some other games with multiple activities, the different activities all seem like variations of each other. Here, they all feel different. Unique. There are a couple of additional things I'd like to see, of course: additional games, more players, and some of the games as demos as well. Overall, I'd definitely say that the game is a success and I very much recommend it. Allow Fit or Rubik's Cube to be downloaded as a single-player demo. Increase the number of Single-Card Download compatable activities. Organize Fit and Switch so that they can be played by more (4? 8?) players. Fix the sensitivity on the Rubik's Cube minigame. Add in options (time limit settings, difficulty settings, etc.) for Fit and Switch. 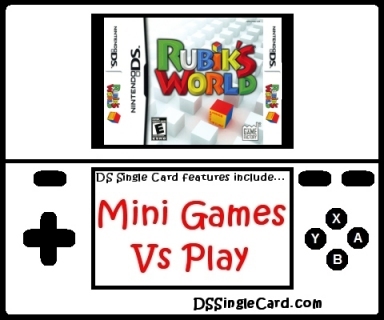 Click here to return to the DSSingleCard.com Rubik's World profile.